From top left to right: Sunset over the Helmand River; Lashkargah Mosque; Lashkargah streets; Mirwais Nika Park. 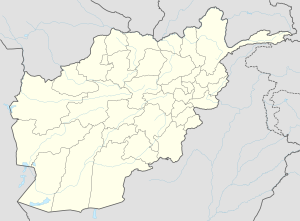 Lashkar Gah (Pashto: لښکرګاه‎) (Persian: لشکرگاه‎), also called Bost, is a city in southern Afghanistan and the capital of Helmand Province. It is located in Lashkar Gah district, and is between the Helmand and Arghandab rivers. The city has a population of 201,546 as of 2006. Lashkar Gah is linked by major roads with Kandahar to the east, Zaranj to the west, and Herat to the north-west. Football is the popular sport in Lashkar Gah. The Lashkar Gah Football Stadium was rebuilt in 2006. It can hold around 10,000 spectators. Currently, 13 registered cricket teams play at the new Karzai Stadium in Lashkar Gah. ↑ "The State of Afghan Cities report2015". Archived from the original on 31 October 2015. ↑ 2.0 2.1 "B. Demography and Population" (PDF). United Nations Assistance Mission in Afghanistan and Afghanistan Statistical Yearbook 2006, Central Statistics Office. Afghanistan's Ministry of Rural Rehabilitation and Development. Retrieved 2011-01-12. ↑ Stanikzai, Zainullah (June 25, 2009). "Karzai Stadium reconstructed". Pajhwok Afghan News. Retrieved January 13, 2012. This page was last changed on 4 February 2019, at 13:34.